(1) S'rî S'uka said: 'Oh King, the Supreme Lord Hari, the Controller, thus being glorified by the godly ones then appeared before them with an effulgence of a thousand rising suns. (2) For that reason the vision of the demigods was blocked that very moment. They could not see each other any longer, nor see anything in any direction, neither in the sky nor on the land, not to mention the Almighty One Himself. (3-7) The moment the Supreme Lord Viriñca [Brahmâ] and Lord S'iva discerned His immaculate appearance that was as beautiful as a dark gem, when they saw [the white of] His eyes as pink as a lotus heart, His yellow silken dress that shone like molten gold, the great beauty and grace of all His limbs, the cheeks of His enchanting face, His smile, His beautiful eyebrows and the attractive arrangement of His jeweled helmet, the decoration of all His ornaments, the light from His earrings, His belt and bangles, His necklace and ankle bells, the Kaustubha gem on His chest that moved with S'rî Lakshmî, His flower garlands and His cakra discus and other weapons pleasing Him in their personal forms, all the immortals together with the Supreme Personality of Destruction [S'iva] prostrated before Him. The master of all the gods [Brahmâ], then worshiped Him [as follows]. Third revised edition, loaded June 16, 2012. S'rî S'uka said: 'Oh King, the Supreme Lord Hari, the Controller, thus being glorified by the godly ones then appeared before them with an effulgence of a thousand rising suns. For that reason the vision of the demigods was blocked that very moment. They could not see each other any longer, nor see anything in any direction, neither in the sky nor on the land, not to mention the Almighty One Himself. The moment the Supreme Lord Viriñca [Brahmâ] and Lord S'iva discerned His immaculate appearance that was as beautiful as a dark gem, when they saw [the white of] His eyes as pink as a lotus heart, His yellow silken dress that shone like molten gold, the great beauty and grace of all His limbs, the cheeks of His enchanting face, His smile, His beautiful eyebrows and the attractive arrangement of His jeweled helmet, the decoration of all His ornaments, the light from His earrings, His belt and bangles, His necklace and ankle bells, the Kaustubha gem on His chest that moved with S'rî Lakshmî, His flower garlands and His cakra discus and other weapons pleasing Him in their personal forms, all the immortals together with the Supreme Personality of Destruction [S'iva] prostrated before Him. The master of all the gods [Brahmâ], then worshiped Him [as follows]. S'rî Brahmâ said: 'The One who never took His birth but always makes His appearance, the One free from the modes of nature, that ocean of bliss beyond all existence, He smaller than an atom whose form can never be conceived, You the Supreme Authority, we time and again offer our obeisances [see also B.G. 4: 6]. This form of You, oh Best of all Persons, is worshipable and auspicious to all who in their yoga practice are striving in accordance with the Vedic directions of the Tantras [specific Vedic treatises]. Oh Supreme Director, we can see us together with the three worlds in You, in Your form of the universe. This framework of the soul has its beginning in You, its middle in You and its end in You. You as the beginning, the middle and the end of the universe are like the earth that is the ruling element of an earthen pot. This universe entirely depending on You, that You by means of Your deluding material energy have created, this universe that generated from You and of which You are the shelter, You have entered. Developed minds connected to You and who are versed in the scriptures see from a spiritual perspective that while [physically speaking] a transformation of the three modes takes place You nevertheless are not determined by those modes. People who by their practice of yoga are intelligent with the modes of nature, will, so confirm the scholars, attain You the way one obtains fire from wood, the nectar of milk from cows, food grains and water from the earth and a livelihood from endeavoring. Now that we today see You appear before us in the full of Your glory as the Master with the Lotus Navel for whom we longed such a long time, we have attained our goal to see the supreme of happiness, like being elephants who, in distress because of a forest fire, reach the water of the Ganges. About what could we inform You who are the witness of all and everything? Please, oh great Soul present within and without, can You for us, the rulers of the entire universe, do that for which we have sought Your lotus feet? S'rî S'uka said: 'Thus being worshiped by the godly ones led by Viriñca [Brahmâ], He understanding their hearts, replied with a voice rumbling like the clouds the ones who with folded hands were holding their breath. Even though the Lord independently could perform the duties of all the God-conscious ones together, He as their Lord and Master wanted to enjoy the pastime of churning the ocean and [therefore] spoke [as follows] to them. The Supreme Lord said: 'Listen oh Brahmâ and S'iva, oh gods, to what I am going to tell you. All of you listen attentively, for that will assure you Suras of the ultimate happiness. Just settle temporarily for the blessings You will receive from making a truce with the Daityas and Danavas who presently have the time on their side. Oh gods, if it is important to one's duties one should even make terms with one's enemies, like a snake would do with a mouse, depending the position he is in [*]. Forthwith endeavor for producing the nectar drinking which any living entity in mortal danger can become immortal. Cast all kinds of creepers, grasses, vegetables and herbs into the ocean of milk and attentively engage with My help, oh gods, in churning using Vâsuki [the snake] for the rope and the mountain Mandara for the churning rod. It will engage your Daitya opponents, but you will reap the fruit of that activity [the nectar]. Do not get angry about it, because to engage in peace is the best way to attain all one's goals. 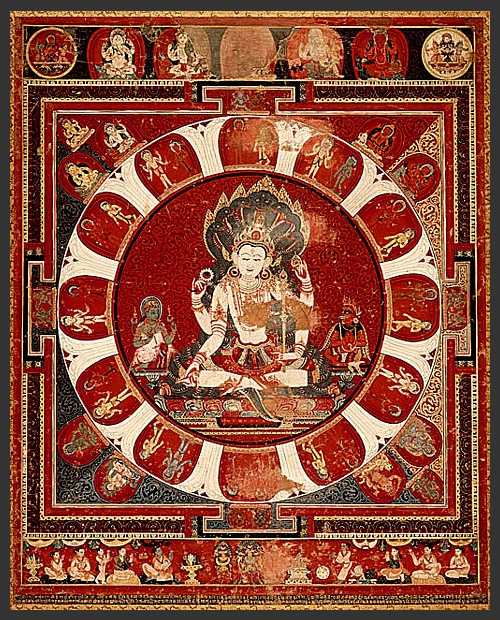 Accept therefore everything that the Asuras demand, oh Suras. S'rî S'uka said: 'After the Almighty Lord thus had advised the demigods, the Supreme Personality, the Controller moving at His pleasure, disappeared from sight, oh King. Upon having offered Him, the Supreme Lord their obeisances, the Great Father and Lord Bhava [S'iva] returned to their abodes. The Suras then approached King Bali. The honorable ruler of the Daityas [King Bali] saw that, even though his captains stood prepared, their [divine] enemies had no plans to fight against them and thus he held them back. He knew when it was time to fight and when it was time for negotiations. They together approached the son of Virocana [Bali] who sat before them, he who, well protected by the Asura commanders, as the conqueror of all the worlds was blessed with great opulence. The great Indra pleased him with friendly words to the best of his ability and submitted with great intelligence to him all that they had learned from the Supreme Personality. That was [politically spoken] all very acceptable to both the Daitya ruler and the other Asura chiefs S'ambara, Arishthanemi and the rest of the inhabitants of Tripura. Next having decided to be friendly with each other, they, Deva and Asura, embarked on the supreme enterprise of churning for the nectar, oh chastiser of the enemies. For that purpose they with great force and loud cries uprooted Mandara Mountain, embraced it firmly and brought it to the ocean. Carrying the load over a great distance Indra and the son of Virocana being fatigued could not support the load any longer and dropped it on the road. The gigantic golden mountain falling down right there crushed with its great weight many of the enlightened and unenlightened souls. 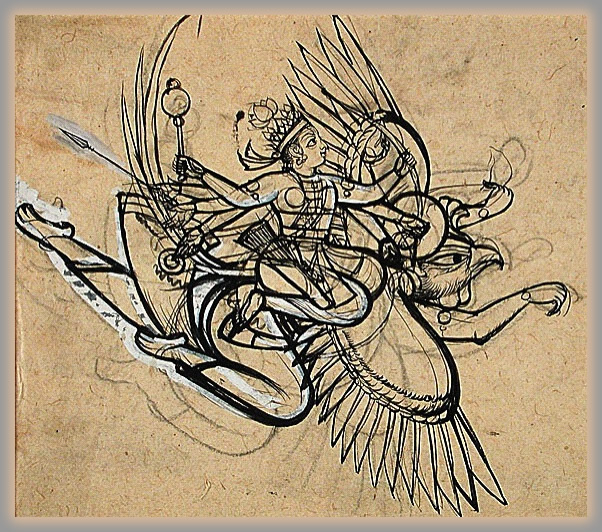 Then the Supreme Lord seated on the back of Garuda appeared before them who had broken their arms and legs as also their hearts. Simply glancing over the immortals and mortals who were crushed by the falling mountain brought them back to life unscathed and free from grief. With the greatest ease He placed with one hand the mountain on Garuda, also mounted and went to the ocean, surrounded by the Suras and Asuras. *: The idea here is that of a mouse with a snake caught in a basket, wherein the mouse makes a hole for both to escape after which the snake eats the mouse. India, Rajasthan, Bundi, South Asia, circa 1750-1775. Courtesy LACMA.